As you’re giving a PowerPoint presentation, you may want to make some notes on the slides, such as circling a word, underlining a phrase, or highlighting a key concept. The Pen tools enable you to do all those things. Making these changes is called annotating. Laser Pointer: This tool does not leave marks on the slide. Pen: The Pen leaves a thin line. Highlighter: The Highlighter leaves a thick, semi-transparent line. Eraser: This removes other annotations selectively. 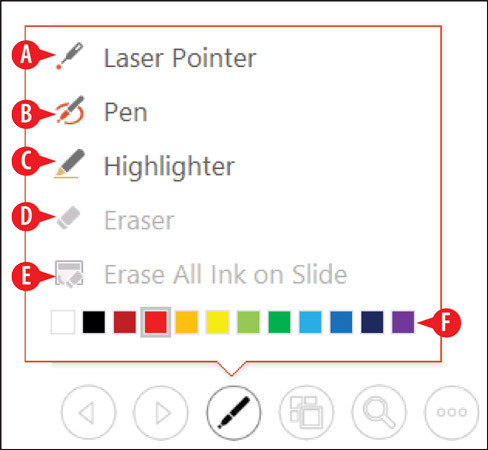 Erase All Ink on Slide: This removes all annotations from the current slide. Ink color: This changes the ink color used by the Pen and the Highlighter. When you leave Slide Show view after using one of the pen tools, a dialog box pops up, asking whether you want to keep your ink annotations. If you choose to keep them, they appear on the slides as ink annotation objects, which are very much like line drawings that you might create by going to the Insert tab and clicking the Shapes button.